Beautiful Salmon Fishcakes served with a Ginger and Coriander Dip. Heat a little oil over a medium heat and gently sweat the onion and garlic until just softened and then allow to cool. In a bowl combine the mashed potatoes, lemon zest, onion mixture, and egg yolk and mix well. Break in the cooked salmon into the mixture and carefully mix together. Check for seasoning. Divide the mixture into 4 – 6 pieces, sprinkle with a little plain flour and shapes them. Transfer to the fridge and allow to rest to set the fish cakes. In a separate bowl, whisk together the eggs and place the breadcrumbs in a third bowl. 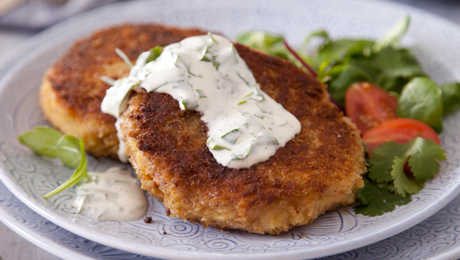 Place the flour-coated fishcakes, one at a time, into the egg mixture, ensuring it is fully coated in eggs mixture before transferring it to the breadcrumbs. Heat a large frying pan, over a medium low heat with olive oil and butter and pan fry the fish cakes for approximately 2 minutes on each side until they are golden brown. Place on a flat baking tray, transfer to the preheated oven and continue cooking for 10-12 minutes to ensure warmed through. Meanwhile, prepare the dip, in a small bowl, combine the crème Fraîche and mayonnaise with the grated ginger and chopped coriander. Check the seasoning and add a squizz of lime juice if needed. Serve the dip with the fishcake.